A terrible crane accident. 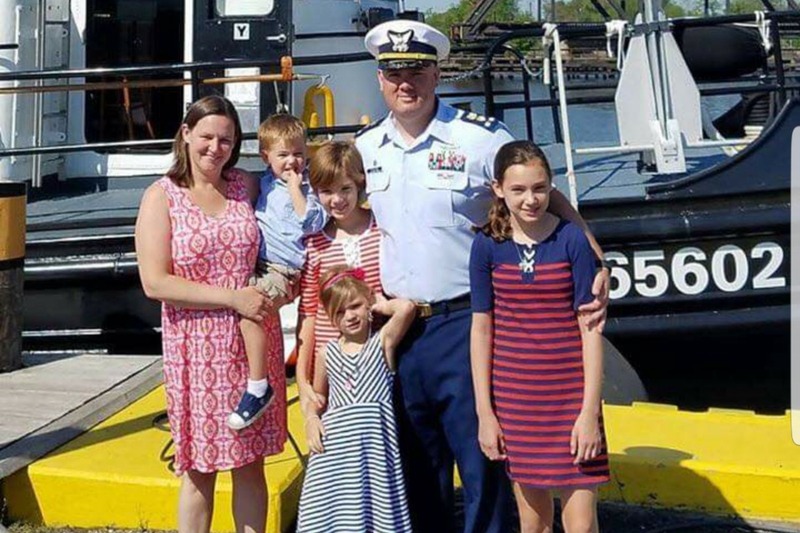 on duty, on January 31st, 2019, took US Coast Guard member, Mike Kozloski from his beloved family. Please help the Alaska Training Room raise funds to assist his wife, Brie, raise their 4 beautiful children. Thank you for your kindness and generosity. I cannot possibly express the gratitude i am feeling right now. Your generosity and love towards Brie and the children has blown my expectations right through the roof. When I created this page, I wanted to offer Brie the gift of time. Time to breathe, time to assess her family's needs and future; and time to adjust to life after Mike's sudden death. Thank you, from the bottom of my heart, to all who know the family, know and love a Coast Guard member, or just donated out of the goodness of your heart. God Bless you all and God Bless the Kozloski family as they say goodbye to Mike this week. As I approach the day that I say goodbye to my friend, Mike, I am overcome with many emotions. Last year I had not intended to actually coach a Little League Softball team but there I was on the first day with my hat on and a glove on my hand. That is when a friendly father donning a mit, a dimpled smile and his two young daughters walked up and introduced himself. He told me that he was glad to help, with anything and everything, and boy did he. As long as the Hickory was in the harbor, there was Mike with his sunny disposition and endless energy. It was like having one of my my brothers with me. He found me one day trying to drag the field before a game, walking backwards with a 50# grate. We took turns dragging that whole infield and talking about life. A trip out west to set buoys was approaching and although it was his duty, Mike didnt like leaving his family. He loved watching his girls play ball and missed his family dearly. He was dutiful in his efforts to help me prepare and maintain the fields for games, as well. He was a giver, a do- er and a Godsend. He was genuinely good, and caring and thoughtful. He and his wife, Brie, were a team who complimented and adored each other. The whole family exuded love and that is why I quickly grew to love my young catcher and her beautiful family. Later in the summer, Mike and 'Madz' worked out together at my gym, the Alaska Training Room. My ATR family is precious to me. I often give nicknames, so Mikey and Madz fit right in. When I discovered that Mike had died last week I felt like someone had punched me in the stomach. It physically hurt me. It hurt to think of Brie, Madeline, Bayleigh, Cassidy and little Mikey going through the rest of their lives without him. That is why this campaign has been so deeply personal to me. God brought Mike Kozloski into my life when I needed him and I will be here for his family when and in whatever way I can...that is how family's work. For those of you on the east coast..